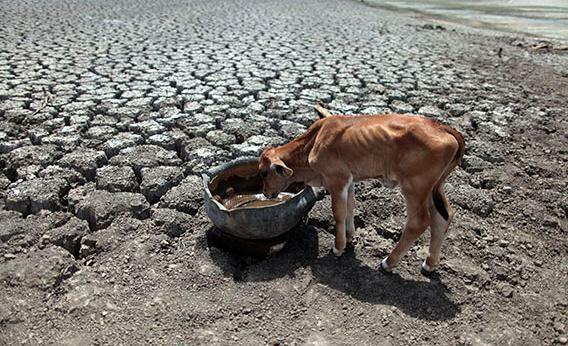 Farmers don’t believe in climate change, but maybe that’s OK.
A calf drinks water on cracked ground at the Las Canoas dam in Nicaragua on April 26, 2013. If it isn’t torrential downpours, then it’s too dry. If there’s one thing U.S. farmers can count on, it’s bad weather, and perhaps as a result, many of them don’t think humanity is to blame for the long-term shifts in weather patterns known as climate change. But even though agriculture is a major contributor to global warming, it may not matter whether farmers believe in the environmental problem. It’s not just the Corn Belt: Farmers across the country remain skeptical about climate change. When asked about it, they tell me about Mount Pinatubo and weird weather in the 1980s, when many of today’s most established farmers were getting their starts. But mostly I hear about cycles in the weather, like the El Niño–La Niña cycle that drives big changes in North American weather. Maybe it’s because farmers are uniquely exposed to bad weather, whether too hot or too cold. Almost any type of weather hurts some crop; the cereals want more rain, but the sweet potatoes like it hot and dry. Year-to-year variability in the weather dwarfs any impact from a long-term shift in the climate. Consider this: A farmer in Iowa might deal with a 10-degree-Fahrenheit shift in average temperatures from year to year, so why worry about a 3- or even 4-degree shift over 100 years? As the old saying goes: If you don’t like the weather, wait five minutes and it will change. The long-term prediction for the Corn Belt in Iowa says that the weather will get hotter and drier—much like western Kansas is currently. Yet, over the decades of Miller’s farming career, conditions have been increasingly wet. “If I had done what climate alarmists had said to do, I would have done exactly the wrong thing for 20 of the last 25 years,” Miller says. Tim is not a random sample, of course. But big farmers certainly aren’t skeptical about all science, particularly the kind of science that makes them money by improving yields. “Last year’s drought was in many places as deep as it was in 1933, and yet we didn’t see too many stories of blowing dirt storms,” like in the “dirty ‘30s,” notes former North Dakota farmer Roger Johnson, now head of the National Farmers Union. * Breeding and genetic modification have brought crops resistant to drought and flood, as well as insect pests. Also important are better tilling practices, such as leaving a cover crop or stubble to hold down the soil, which helped the dirt stay in place. Even in the depths of the 2012 droughts, the United States delivered an abundant harvest. But the biggest change delivered by science to farming in the past century is the one my brother is working to reverse: the advent of fossil-fuel-powered machinery and fertilizer wrested from the air by chemistry. That, along with cutting down forests to make room for farms around the world, makes agriculture the second-largest cause of the greenhouse gas emissions changing the climate. There’s methane from massive meat farms and manure lagoons. There’s nitrous oxide—yes, the stuff used at the dentist’s office—seeping out of the soil thanks to all that nitrogen fertilizer, and it’s no laughing matter since N2O is nearly 300 times more powerful as a greenhouse gas than CO2 over a century. Also in Future Tense’s July series on agriculture and climate change: Michael Pollan explains the difference between “sun food” and “oil food,” and Frederick Kaufman explores the potential of open-source GMOs. Correction, July 16, 2013: This article originally gave an incorrect first name for the head of the National Farmers Union. He is Roger Johnson, not Robert Johnson. The piece also stated that farmer Kevin McCullough uses a combine for tilling. He uses a tractor.